Before facing Alexander Povetkin, it was quite a while since Wladimir Klitschko was placed against a formidable opponent with the promise of an exciting match. Most of Wladimir’s opponents were written off by the boxing community before the first bell ever rang, similar to how Mike Tyson used to tune the boxing public to believe that the fight was never going to be competitive. That was until one of the biggest and most important challenges to Wladimir Klitschko was signed as his competitor. Alexander Povetkin was supposed to be the fighter to give Klitschko trouble, and possibly expose his so called glass chin once again. Not only did people show interest in that fight, but the event itself yielded record profits. Moscow was buzzing with excitement during the build-up, and even more so during fight night. Unfortunately, it did not turn out to be an electrifying event, with slow action, holding, and of course questions for the referee after the fact. 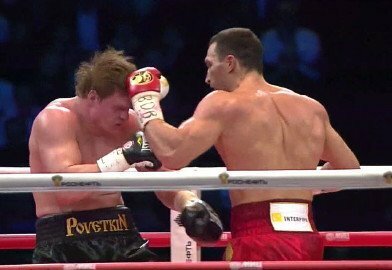 Team Povetkin was not happy with the referee allowing Klitschko to lean and tie up Povetkin. At the same time, Wladimir had his own version of the story, claiming that Alexander was coming in too low on purpose. Of course being that this fight was in part patriotism driven (Ukrainian vs. Russian), the boxing fans took their frustrations online, fighting and offending each other. “I am not happy that all this is shifting into political themes, and that people are fighting each other on the internet. Usually this kind of an event brings people together. Remember that during the Olympics, wars were halted. There was a lot of animosity from both ends. Some things were coming from the Russians, and some from the Ukrainians. Note that after the fight, the boxers themselves were very polite to each other. What does it matter what the relationship is with Ukraine. In my opinion, Russia, Belorussia and Ukraine, are one entity,” stated Ryabinskiy to Boxingnewscom.ua.